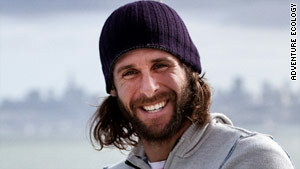 David de Rothschild: "The expedition has always been about more than the destination." de Rothschild: "Need to redesign, revalue, reduce, reuse, and rethink use of plastic"
Editor's note: David de Rothschild, the man behind the Plastiki expedition and the voyage's "Chief Curiosity Officer," writes about the expanding presence of plastic across the planet, and the need to rethink recycling. (CNN) -- Ever since the Industrial Revolution in the 18th and 19th centuries it seems the barometers of success and modernity within society have been measured by our interaction, or lack of interaction, with the natural world. The formula appears to be simple: The more we package, mechanize, and force nature into the background, the more developed and evolved our society will become. What we produce and consume has become a representation of our values and identities. The almost automated desire to take nature and manipulate it to meet this formula -- to create a more linear, predictable, controllable commodity out of it -- is constantly being taken to new extremes. We are even creating experiences that can best be described as manufactured landscapes like Japan's Sea Gaia Ocean Dome, the world's largest artificial beach (thankfully now closed). It made for a pristine paradise with perfectly groomed sand made of crushed white marble, a permanent blue sky and constant 30°IC (86°Fe) temperature. All of which existed just 300 meters from the real ocean. Tragically, it's now conceivable that we have reached a point at which whole generations are no longer aware of or in touch with the true, raw, and unadulterated natural world. Nature is often no longer perceived as natural unless it comes in a glossy plastic package with an instruction manual. Together is the only way we can move forward and create the necessary solutions for our oceans and our planet. For most, this "nature deficiency disorder," this blurring between artificial and real seems so perfect, so convenient. However, it's this convenience, coupled with a voracious appetite for one-time-use plastics that is now hurtling back toward us as an ever-growing and devastating set of plastic fingerprints on our natural world. It's not well-known or even thought about but ever since Leo Hendricks unveiled the first fully synthetic moldable hard plastic called Bakelite to the American Chemical Society in 1909, except for a very small percentage that has been incinerated, every single molecule of plastic ever manufactured still exists somewhere in our environment. The most apparent and shocking of which is the plastic waste that can now be found scattered across the surfaces and the depths of our planet's oceans. It's beyond tragic to articulate. For me, the stark reality of the situation kicked in back in 2006 when, during the research and planning stage for my next Adventure Ecology expedition, I came across a UNEP publication titled "Ecosystems and Biodiversity in Deep Waters and High Seas." The report pointed out that on or below every square mile of our ocean, there were 46,000 pieces of floating marine debris and that the problem was particularly acute in certain areas. From ocean trenches in the Atlantic to floating particles across the farthest reaches of the Pacific, synthetic polymers are on the rampage; as much as 90 percent to 95 percent of the total amount of marine debris is plastic, leaving less than 10 percent made up of slowly degrading materials such as timber and glass through to more hazardous and hard to clean up, medical, industrial and raw-chemical, sewage-related waste. Unlike organic compounds, plastic doesn't biodegrade. Plastic is impervious to enzymatic breakdown. It's literally jamming up the code of nature. Which means the very durability that makes plastic so useful to humans also makes it incredibly harmful to all the natural life cycles in every ecosystem worldwide. But what's crazy about this situation is that it simply doesn't have to be this way. We need to redesign, revalue, reduce, reuse, and ultimately rethink our use of plastic so that it can contribute to solutions rather than compounding the problems. So with a respectful nod to the Kon-Tiki and its audacious, attention-grabbing voyage of 1947 a storyline that created one of the most compelling and captivating adventures of the last century, the Plastiki expedition was born. A simple concept was developed: could we construct a boat entirely out of two-liter plastic bottles, recycled waste products and innovative materials to sail across the Pacific, with the notion that the project would become an opportunity to showcase solutions that could ultimately help revalue waste materials, how we use them, what we use them for and most importantly how we dispose of them. When the dream left my head and became the adventure that it is today, we were suddenly faced with a number of major hurdles. We were trying to build a boat that had not only to be capable of crossing our largest ocean but had to do so using unconventional and for the most part unproven materials. After well over 1,000 days since the initial idea we will be unveiling a finished vessel that showcases smarter designs that rethinks how we look at the waste that's polluting our seas and utilize it as a resource and as a solution. To get to this point the expedition has always tried to focus on more than the destination. It's been our journey and the way of viewing the process that created a platform for smart thinking and a place where everyone acknowledged nobody was as smart as everybody. We strived for cultivating a community of thought leaders, designers, engineers, and scientists who recognized their roles as part of one holistic system in which every individual action creates a reaction. Now more than ever we need to stop and realize the devastating impact of our ever-increasing human fingerprints. Together is the only way we can move forward and create the necessary solutions for our oceans and our planet, so we can stop apologizing to the million seabirds and 100,000 marine mammals unnecessarily killed and to the children of today and tomorrow who are already asking, "Why isn't anyone reacting?" For some answering that question means lobbying companies and communities to find alternatives to plastic packaging. It might entail getting governments to expand recycling programs and accommodate bio-plastics in the marketplace. I also advocate all of the above actions. The difference is that the Plastiki is looking to inspire something larger -- a sea of change, in how we view waste and how we integrate it back into the web of life. This starts first off with recognizing that there isn't a place called "away". It involves nurturing and directing inquisitiveness toward inventing smart ways to design and use everyday materials. We took the plastic bottle that in so many ways symbolizes all that's wrong with Dumb Planet 1.0 ways of thinking and turned it into a platform of hope by showing that it can be an effective and useful resource. If a little curiosity, imagination and time can engineer plastic bottles into a boat and that boat can then forge its way into the collective imaginations of people everywhere, then who knows what else is possible? One day, maybe, we could dream for more than just for the survival of our oceans.